The grid shows the prices and daily availability from Wed 24 Apr 19 to Tue 30 Apr 19. It's easy to check availability for particular dates; just use the calendar to choose the check in date, select the number of nights and click the 'Search' button. Click the Book or Reserve button to book the highlighted days. With Book the room booking will be confirmed immediately, with Reserve the room reservation will be confirmed within 24 hours.. Friendly family home with comfortable rooms and relaxed atmosphere. 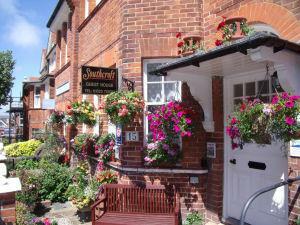 Edwardian guest house located in the Meads area of Eastbourne. All rooms are en-suite and tastefully decorated. Start the day with a hearty breakfast or a lighter option, plan your visit in our comfortable lounge. Close to the seafront, theatres and within easy walking distance of the town centre. 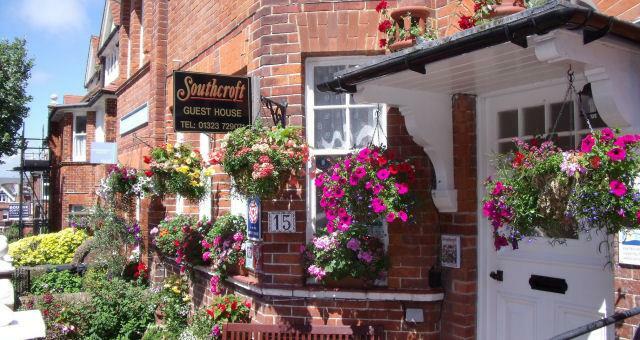 Ideally located for those walking the South Downs Way. The re-decorated guest lounge is always available for our guests to use during their stay, to read, watch television, chat or just relax at the end of the day. The courtyard garden is available to our guests when we are on site. Thank you Nicholas for your kind review. From Eastbourne Station (to walk), cross the road immediately opposite the Station entrance into Grove Road - walk straight down Grove cross into Grange Road and walk to the end, turn left into Silverdale Road the take the first right which is South Cliff Avenue. Proceed up the hill and number 15 is about 2/3rds of the way up on the left. Walking time is approx 15 minutes, the number 3 bus from the Station (every 30 mins) will take you to Silverdale Road, at the bottom of South Cliff Avenue. Alternatively, take a taxi from outside the Station. Due to the nature of the building we are not accessible for guests with wheelchairs but are pleased to make provision to accommodate any special needs which we are able to.